This page describes the radio streaming features of MythMusic. For the regular music files playing part see MythMusic. This is the screen that is shown when you go to Media Library->Listen to radio stream or you can switch to this view from the 'Change View' option of the popup menu. 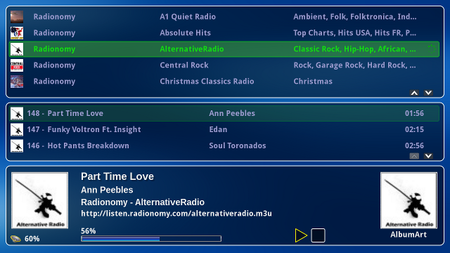 This screen shows the list of radio streams you have configured at the top, a list of previously played tracks in the middle and the currently playing tracks metadata below as well as the visualiser, buffer fill status, volume status and some playback controls to start/stop playback. 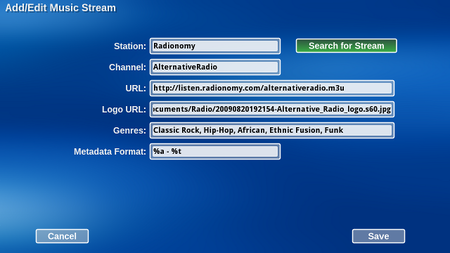 The popup menu shown when MENU is pressed allows you to Add/Edit/Delete the selected radio stream. When in the main radio streaming view press MENU and choose 'Add Stream' which shows the Add/Edit Music Stream screen as shown below. On this screen you can enter the details of the stream to play or if you click 'Search for Stream' you will be able to choose a radio stream from the 750+ predefined example streams that are distributed with MythMusic. On the 'Search for Music Stream' screen you can filter the available streams to find what you want. Pressing SELECT on a stream in the list will choose that stream and return to the editor screen where you can amend any details before saving the stream. Note: The example streams supplied with MythMusic are only a tiny fraction of the streams available, if you don't find what you want search the Internet and manually enter the details on the Add/Edit Music Stream screen. 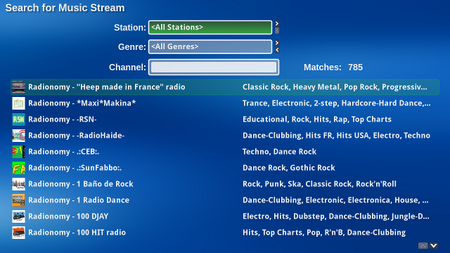 On the main radio streaming screen press MENU and choose 'Add Stream'. On the 'Add/Edit Music Stream' screen enter the details of the stream. The items on this screen are described below. Station - This can be anything you want but will usually be the name of the station/organization that produces the stream. Channel - Again can be anything you like but will usually be the name of the channel/stream. URL - This is the important part it must be a URL where a valid pls or m3u file can be downloaded for the stream you want to play. Logo URL - This should point to a URL where an image for the stream can be download. If left blank a default Icecast image will be used. Genres - This should be a comma separated list of genres associated with the stream. This page was last modified on 30 December 2012, at 16:41.